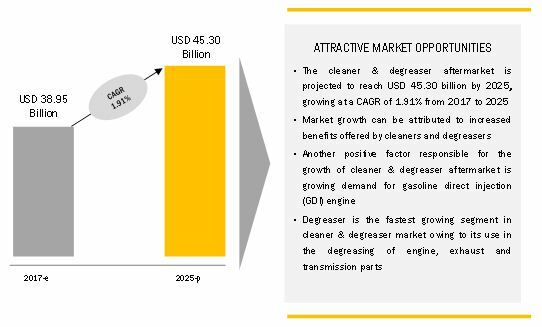 [168 Pages Report] The cleaner & degreaser aftermarket is valued at USD 37.41 Billion in 2016 and is projected to grow at a CAGR of 1.91% during the forecast period. The base year considered for the study is 2016 and the forecast period is from 2017 to 2025. Growing demand for improved vehicle performance, increase in fuel efficiency, and the need to minimize vehicle emissions have triggered the growth of the cleaner & degreaser aftermarket. The research methodology used in the report involves primary and secondary sources and follows bottom-up & top-down approaches for data triangulation. Extensive secondary sources, directories, and databases have been used to gather and classify facts and figures useful for a technical, market-oriented, and commercial study of the cleaner & degreaser aftermarket. Secondary sources include associations such as International Organization of Motor Vehicle Manufacturers (OICA), Emission Controls Manufacturers Association (ECMA), European Automobile Manufacturers Association (ACEA), Environmental Protection Agency (EPA), and International Council on Clean Transportation (ICCT) along with paid databases and directories such as Factiva and Bloomberg. Primary interviews have been conducted to obtain and verify critical qualitative and quantitative information as well as to assess the prospects of the industry. The primary sources include experts from the core and related industries, suppliers, manufacturers, distributors, service providers, technology developers, and organizations related to various segments of this industry’s value chain. Detailed interviews have been conducted with various primary respondents that include key industry participants, subject matter experts (SMEs), C-level executives of key market players, and industry consultants. The cleaner & degreaser aftermarket size, in terms of volume (million gallons) and value (USD million), for various regions has been derived using forecasting techniques based on the demand for cleaners and degreasers, vehicle sales, and vehicle parc trends. The prices of cleaners and degreasers have been validated through primary sources. The ecosystem of the cleaner & degreaser aftermarket consists of manufacturers and Tier I, Tier II, and Tier III suppliers such as BASF (Germany), 3M (US), WD-40 (US), and Dow (US). Cleaner and degreaser are the solvents used to remove the oil, dirt, and grease accumulated on the automotive parts from inside and outside. Degreaser and cleaner have different chemical compositions that help in cleaning more efficiently. The increasing demand for better engine performance, improved fuel efficiency, and reducing vehicle emissions could boost the cleaner & degreaser aftermarket. On the other hand, the increasing sales of electric vehicles and health regulations can hinder the growth of the cleaner & degreaser aftermarket. Ongoing new product developments by leading companies for bio-degradable products to control pollution, and recent technological developments in automotive chemicals are likely to propel further growth of the cleaner & degreaser aftermarket during the forecast period. Benefits offered by cleaners and degreasers. Growing demand for the gasoline direct injection (GDI) engine. Technological advancements in engine coating. New technologies adopted for manufacturing cleaners and degreasers. Hybrid degreasers for heavy duty vehicles. The cleaner & degreaser aftermarket is going through demand-supply gap, when will this scenario ease out? How and why OES is the fastest growing market in cleaner & degreaser aftermarket? How the industry players will address the challenge of unorganized players in cleaner & degreaser aftermarket? 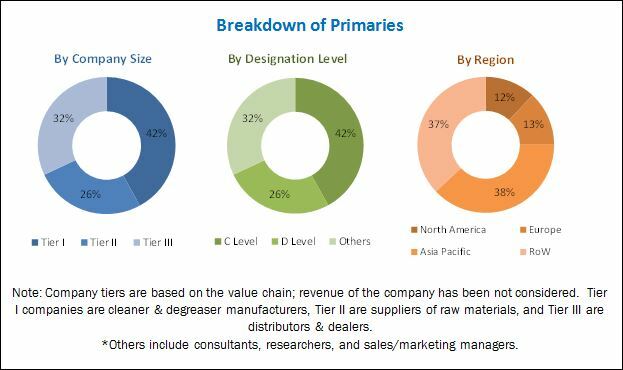 The cleaner & degreaser aftermarket is projected to grow at a CAGR of 1.91% during the forecast period, from USD 38.95 Billion in 2017 to USD 45.30 Billion by 2025. Rising demand for better fuel efficiency, larger vehicle parc, increasing vehicle sales, and the increasing average vehicle miles travelled every year have fueled the growth of this market. This Market has been segmented on the basis of parts. The cleaner aftermarket is further divided into the brake, carburetor, engine flush, catalytic converter, and others. The degreaser aftermarket is further divided into the engine, exhaust, transmission, and others. The growth of the cleaner and degreaser aftermarket can be attributed to the increasing adoption of preventive/periodic maintenance services in vehicles. Preventive/periodic maintenance not only increases the average vehicle age but also enhances fuel efficiency. Likewise, the growth of the cleaner & degreaser aftermarket for engine flush cleaner can be attributed to factors such as a worldwide increase in vehicle sales and increased average vehicle miles travelled. The cleaner & degreaser aftermarket has been segmented by type. The cleaner market is further segmented into water and solvent based cleaners. Water-based cleaners use water as a base instead of a chemical. Water-based cleaners do not contain harmful chemicals that are found in solvent-based cleaners. Asian countries use water-based cleaners as these countries do not have norms related to proper disposal of cleaners & degreasers. On the other hand, countries such as Germany and the US have a higher demand for solvent-based cleaners as these countries have stringent norms for environment protection. However, the increasing adoption of bio-degradable cleaner and degreaser products globally, which are primarily water-based, will drive the growth of water-based cleaner & degreaser aftermarket. Hence, in the future, water-based cleaners and degreasers are expected to witness higher demand owing to their benefits over solvent-based cleaners and degreasers. The cleaner & degreaser aftermarket has been segmented on the basis of supply modes into aerosol can, drum, jug, pail, and spray bottle. The cleaner & degreaser aftermarket for spray bottles is expected to show the fastest growth. The spray bottle offers capacities of 12, 14, 16, 20, 22, 24, and 32 ounces. Smaller capacity bottles are used for cleaning hard to reach places. The spray bottles are made of different materials such as aluminum, stainless steel, brass, plastic, and others. Spray bottles, if used properly, can help to achieve cost benefits. Also, these bottles can be refilled. Owing to such advantages, spray bottles are expected to see a huge demand in the future. The cleaner & degreaser aftermarket has been segmented on the basis of repair services into Original Equipment Suppliers (OES) and Independent Aftermarket (IAM). OES suppliers include authorized dealers and service stations. The OES repair services are preferred owing to the quality, reliability, and warranty of products used for cleaning and maintenance. However, IAM is estimated to hold the largest share of this Market. The IAM represents large workshop chains and small independent garages. The cleaners and degreasers used in the independent aftermarket are easily available and cheaper than those used in the OES. The cleaner & degreaser aftermarket has been segmented on the basis of vehicle type into passenger cars, light commercial vehicles (LCV), and heavy commercial vehicles (HCV). Passenger car segment is estimated to be the largest and fastest growing market as the production and sale of passenger cars is higher than commercial vehicles. Also, the on-road vehicle number for passenger cars is very high. Hence, the cleaner & degreaser aftermarket for passenger cars is estimated to have the largest share. North America is expected to dominate the cleaner & degreaser aftermarket during the forecast period. 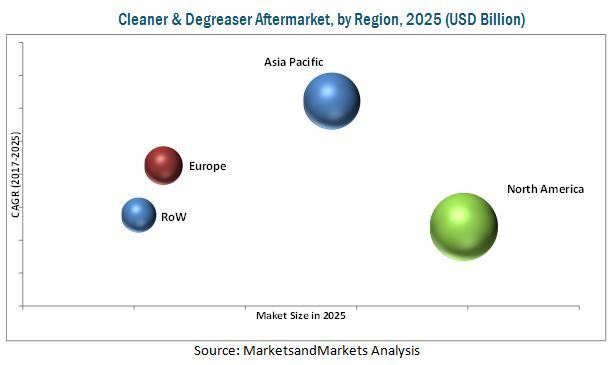 Increasing commercial vehicle sales, awareness about cleaners and degreasers products, and increased average vehicle miles travelled are driving the growth of the cleaner & degreaser aftermarket in the region. Asia Pacific is estimated to be the fastest growing cleaner & degreaser aftermarket during the forecast period. The market growth in the region can be attributed to the increasing awareness of the benefits of cleaner and degreaser products, periodic maintenance services, stringent emission norms, and others. These factors have played a vital role in driving repair services, which in turn help in the growth of this market. The key factor restraining the growth of th is the technological advancement in engine coating. To address fuel efficiency challenges in internal combustion engines, OEMs are innovating with technology advancements in multiple areas including the reduction of carbon deposits in the engine. Anti-coking coatings have been developed to reduce the carbon deposit in the engine. These coatings prevent carbon catalytic interaction with injector metals and significantly reduce carbon deposits on the surface of the engine. Hence, the cleaning and degreasing requirements are reduced, which is likely to have an adverse effect on the growth of the cleaner & degreaser aftermarket. The cleaner & degreaser aftermarket is dominated by a few global players. Some of the key manufacturers operating in the market are BASF (Germany), 3M (US), WD-40 (US), DOW (US), Wurth (Germany), and FUCHS (Germany).